The re-imagination of diagnostic testing beyond laboratory setting. Your tests made easy, at your finger tips. As small as a credit card, the pScreen™ allows anyone to perform blood tests - anytime, anywhere. It only requires a tiny amount of sample. In fact two drops of blood are more than enough. diagnostic tests you need, when you need them. A lot can happen while waiting for medical results to come back from the lab. With the pScreen™ you carry the lab in your pocket. Save Time, Money, and Resources. SIMPLY SCAN YOUR pScreen™, WE TAKE CARE OF THE REST. The pScreen™ App allows you to store and share your test results, all in one place, with one click. Your results are shared with your physicians to assess your condition remotely. For the first time, the pScreen™ makes it possible to easily and conveniently diagnose medical conditions, and monitor illnesses, in the comfort of the home or at the doctor’s office. Critical test results to aid and guide the doctor's decision-making can now be obtained anywhere-anytime when needed, at the patient’s side, instead of away in a laboratory. The pScreen™ transforms the patient blood testing paradigm, from lab-centered to near-patient, bringing significant advantages in terms of simplicity, time to result, care delivery, and cost over current standard lab-based diagnostics. 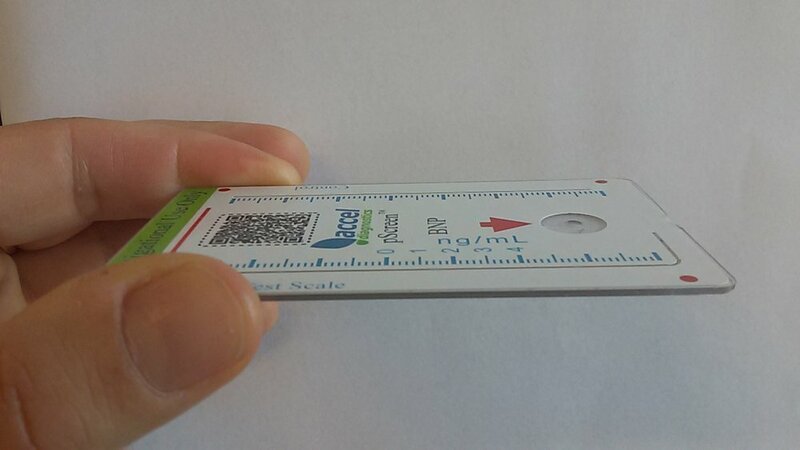 The pScreen is a reader-free mobile-enable blood diagnostic platform. In simple term, this means that the entire test fits in a disposable, credit card sized, self-contained chip, without compromising test accuracy. All you need is the pScreen™. When used by self-testing patients, a companion app enables physicians to remotely monitor and review the test result. The patient is never left alone, and the physician is never in the dark.